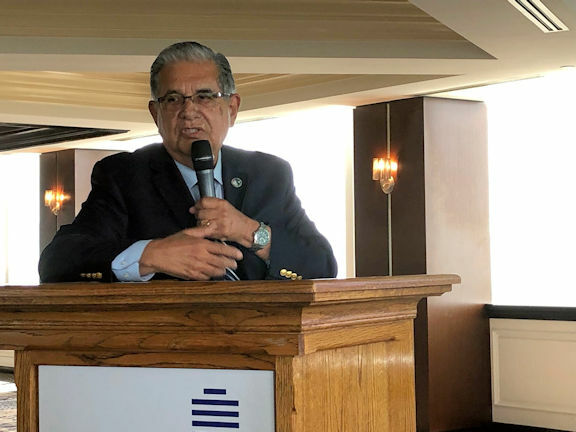 Speaking to members and guests of Ventura Rotary South on Monday, April 8, Ventura County Supervisor John Zaragoza presented a comprehensive summary of the state of the County, detailing recent successes, current projects, and primary challenges facing County officials. Supervisor Zaragoza's 5th District includes Oxnard Shores, Mandalay Bay, Silver Strand, Hollywood Beach, Hollywood by the Sea, Channel Islands Harbor, El Rio, Nyeland Acres, Del Norte, Oxnard College, Oxnard Plain, Strickland and a portion of the Ventura County Naval Base Pt. Hueneme. "Ventura County is one of the safest places in the world," said the Suervisor, "thanks to the work of our public safety personnel and the involvement of our citizens." He noted that County government has a $2.24 billion budget and includes some 26 agencies and departments, staffed by over 9,000 employees, which makes the government the second largest employer in the County behind Naval Base Port Hueneme (19,000 employees). Among the County's key priorities are revenue enhancement, social services (homelessness), public safety and the 2020 Census, which is critical to funding, provision of services, and political representation. Supervisor Zaragoza reviewed a dozen current capital projects in the County, including a $61 million medical/mental health unit at Todd Roadd Jail, a permanent year-round homeless shelter on Knoll Drive, medical examiner facility upgrades, Fillmore Library improvements, and the commissioning of two Black Hawk helicopters for the County Fire District. Focusing on his own District 5, the Supervisor noted a number of topics of interest, including Nyeland Acres Community Center and Park, improvements at Channel Islands Harbor, a cannabis ordinance, the 2040 General Plan, and Science Technology Engineering Arts Mathematics (STEAM) Program at Rio School. Asked about the most pressing challenges facing Ventura County, Supervisor Zaragoza named three: housing, jobs, and water resources. "We have to address all three if Ventura County is going to continue to thrive as one of the most desirable places to live and work."